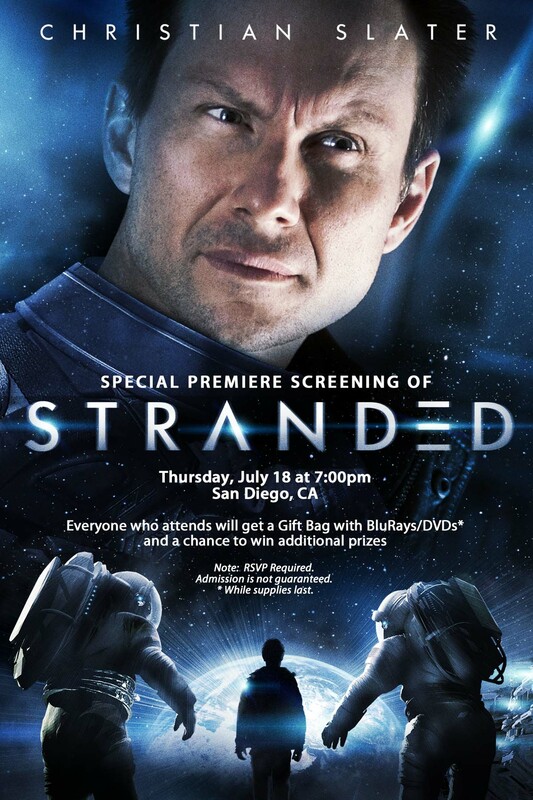 Stranded is going to be screening for San Diego Comic-Con attendees at 7pm on Thursday, July 18th and we have 25 pairs of tickets to give away. The screening has perks (swag! ), head inside for the official event artwork and other details. If you’re heading down to San Diego and want to take in a free flick, e-mail us RIGHT HERE with your FULL NAME, please. We’ll alert you if you scored a pair of tix and offer location details. The film, which gets a release July 26th, stars Christian Slater as Gerard – a man who leads three other astronauts on a mission, when a meteor suddenly collides with their space station putting the lives of the entire crew in danger. Those on board quickly learn that spores from the meteorite can replicate cell structure, reproduce, and mutate. Ava (Amy Matysio), the only female astronaut becomes infected, showing signs of pregnancy at a rapid rate. Within 36 hours she gives birth to a creature that mutates into the life form of another crew member. As the astronauts begin to experience this sinister presence, the virus spreads and Gerard urges for the killing of Ava. The alien being targets the crew one by one, leaving those remaining to destroy it before all are killed.